In my Grooming 101 post, I went over the basics of the morning ritual and the steps one should take in order to properly prepare oneself for an excellent sojourn into the treacherous concrete jungles outside. In this post, I’ll outline 7 grooming tools that most men overlook – tools that can truly elevate your short and long-term prospects. They may be little things, but gentlemen – the devil is in the details. 1) Exfoliator: The use of a proper exfoliator 2-3 times a week in the fall and winter (and 4-5 times weekly in the spring and summer) will truly make a difference. The exfoliator will slough dead skin cells and are a great prep for shaving. Additionally, it will make your skin less oily and prevent breakouts. My favorite one is the Aveeno “Skin Brightening Scrub.” It’s very gentle and feels great as you rub it into your skin. 2) Face Moisturizer with SPF: This is truly a crucial step in every man’s regime. You absolutely NEED an SPF moisturizer. Why? Well for one, you don’t want your skin getting dry and peeling. But even more importantly, using SPF will prevent long term wrinkles and skin aging. I’m currently using Jack Black “Double Duty Face Moisturizer,” and it’s nice and light. Also, it has a great feel against the skin as you put it on. 3) Nail File: We all know that short and trim nails are essential, but most men don’t use a nail file. Most probably don’t even know what one is. A nail file really prevents harsh edges which can be terrible if you accidentally poke someone. The consequences can be disastrous, so use one after you trim your nails in order to smooth down the edges. 4) Badger Shaving Brush: Imagine a soft badger brush sweeping a creamy, white luxurious lather onto your face. The lather softens that hard stubble, opens your pores, and gently exfoliates at the same time. This opulent shaving cream applicator truly elevates the shaving experience. It makes it really fun, soothing, and relaxing. The difference between applying cream with your digits and with your brush is eye opening. Plus, the brush lasts a ridiculously long time. All in all, it’s a great investment! 5) Eye Roller: I started using eye creams after nights with little or no rest. They reduce puffiness and dark circles on the undersides of your eyes, making you look more awake. Then this eye roller caught my eye since you don’t have to touch the product directly to apply…a wonderful product to make those late night circles disappear. 6) Crest Whitestrips: White teeth is totally trendy right now – actually it’s a MUST. No one wants to see yellowed teeth…so take a big step and start whitening them! You will feel ridiculously self-confident with some pearly whites. To start use the Crest 3D White Whitestrips Advanced Seal Professional Effects. Don’t use the weaker versions – be sure to get the professional effects. As a committed user of these, I can say they truly work – but you also have to be vigilant. This means drink less tea, coffee, and wine and more water! 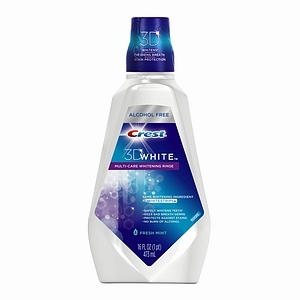 7) Crest 3D White Mouthwash: I had to throw this in there also because I really like this line of products. This is a great mouthwash that doesn’t have the harsh Listerine taste. You gargle it for 60 seconds twice a day, and you really feel great after doing so. Your mouth tastes great, and your smile is a little brighter. It has the same active ingredient as the Whitestrips (hydrogen peroxide). Get out there, use these products, and elevate your grooming game. These seven products will really help you kick it up a notch on your journey to the land of Fab. Leave some comments with any questions for me! This entry was posted in Grooming and tagged Exfoliator, Eye Roller, Grooming, Moisturizer, Nail File, Shaving Brush, Whitestrips. Bookmark the permalink. This is a much needed post for all!!! i LOVE aveeno products. i use the face wash, moisturizer, and spf! Yes, they are really nice – the scrub is great because it’s so gentle.